Veteran journalist Ira Panganiban, on his Facebook account, lambasted Jim Paredes over his criticism to President Rodrigo Duterte. Recently, Jim Paredes defended the former Columbian President Cesar Gaviria after President Duterte called him ‘idiot’ for saying his drug war will be fail. According to Jim Paredes Twitter post, he said that because of Gaviria, the biggest Columbian drug lord got caught. Panganiban lecture Paredes saying that Pablo Escobar was caught by CIA and not the ex-Columbian President. I'll make upak lang Yellow Troll Jim Paredes ha!!! First Dear Jim, it was not Gaviria who caught Escobar, CIA yun darling!!! Second, Peter Lim made takas when PDuts made buking his operations my lovely boy Jim! 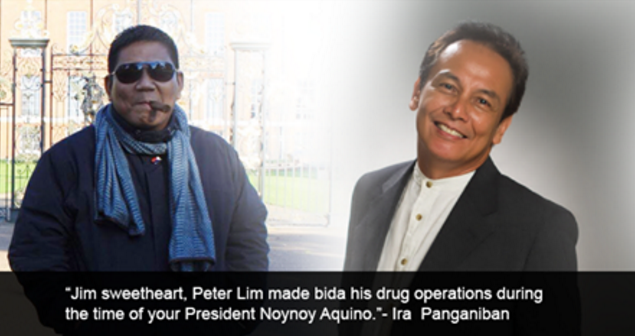 Third, Jim sweetheart, Peter Lim made bida his drug operations during the time of your President Noynoy Aquino. So, my wonderful Jimmy Boy, if you make gamit your almost brand new kokote, seldom used but full of it, then you will make kita that Peter Lim is namayagapag with his drug operations during the last administration and ran for his life during this administration. Is that linaw enough for you my darling Jim??? I think Ira is wrong, it was Brigadier Hugo Martínez, head of the search bloc, who captured and eventually killed Pablo Escobar. Assisted by US special forces, US Army intelligence, as well as members of the CIA and DEA, the Search Bloc pursued Escobar throughout 1992 and 1993. According to official accounts, it was the Search Bloc that ultimately killed Escobar. Intel lang ang sa CIA and DEA. Just like Marwan. The issue should not be who actually implemented the arrest but the tactical planning from the very beginning. Columbia was a narco state for so long that it is common knowledge even by its citizens that the cartel controlled just about every branches of the government. Those who refused to cooperate were either executed or assassinated.Only a more powerful entity such the CIA can make the plan of capturing Escobar succeed.